Alt-weekly newspaper Creative Loafing Charlotte in North Carolina has ceased print production with its October 31st 2018 edition. Creative Loafing, received an email Tuesday night from the paper’s publisher, Charles Womack III. Wednesdays are production days for the paper, which begins circulating in newsstands and kiosks on Thursdays. The email’s message was blunt: Make sure you’re finished with production by noon. t about 12:05, Pitkin said, Womack, who lives and works in Greensboro, knocked on the door. The staff of seven—four in editorial, three in sales—wasn’t expecting him. Womack told them to gather in an office. 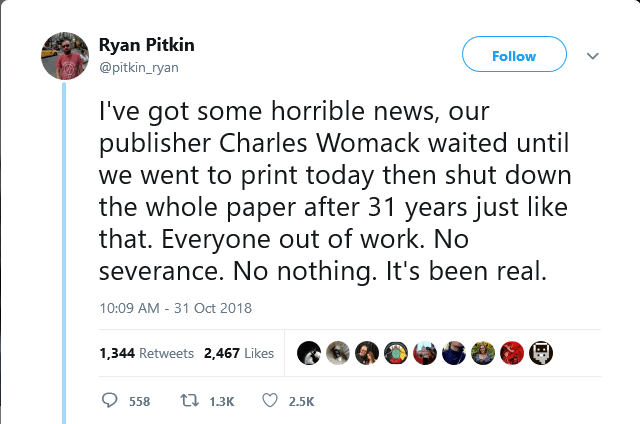 He informed them that his company, Womack Newspapers, Inc., was shutting the paper down, effective immediately. The paper they had just put to bed would be the last Creative Loafing, a year after it had celebrated its 30th anniversary. Charlotte Magazine carries the story. As does the Charlotte Observer. Election night is the ultimate in deadline crunch time for newspapers. Or it was. Gannett is throwing the digital switch. Across its 109 local markets, readers will be directed — starting this Sunday, as editors are being urged to prepare readers in advance — to head to its digital sites for results. Some regular print deadlines end before the polls close. Nieman Lab carries this story. Can Preprints Save the Fishwrap? Toward the end of November a day will come where a newspaper subscriber may have difficulty finding the increasingly slim news content among the overwhelming preprint inserts. But Thanksgiving only comes once a year. However, as all things print switch to digital the preprint insert may be the saving grace. 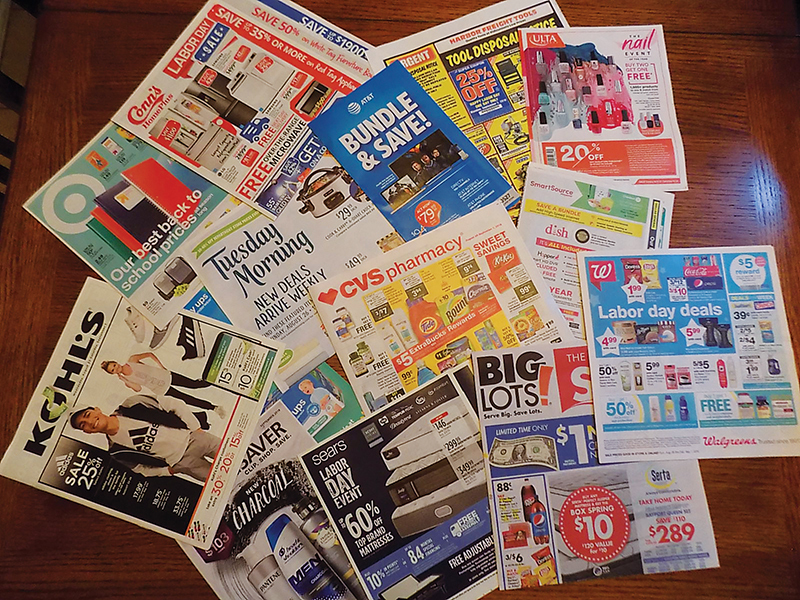 Just a few years ago, the Wall Street Journal published an article that found less than 1 percent of people who read newspapers online click through to digital circulars. If you’ve ever tried to view a digital preprint on your phone, you know that it’s just about impossible and isn’t very user friendly. Additionally, the article claimed that more than 80 percent of individuals who read a print newspaper look through the preprints. Editor and Publisher reports on something print does better. 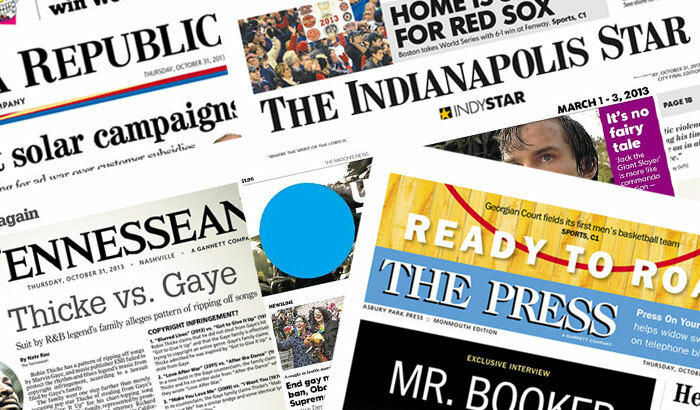 Gatehouse has no plans to ease its drive for newspaper acquisition. It now owns 145 dailies, more than 10 percent of the total, estimated at 1,350 to 1,400. (Because many of the markets are very small, that amounts to less than 10 percent of total U.S. newspaper circulation). It has now spent more than $1 billion over five years on acquisitions. This year’s crop — totaling $156 million — includes The Eugene Register-Guard in Oregon, the Austin American-Statesman and Palm Beach (Florida) Post (both formerly owned by Cox, which kept the Atlanta Journal Constitution), The Pueblo (Colorado) Chieftan, the Akron (Ohio) Beacon Journal, and, most recently, The Oklahoman in Oklahoma City. Gatehouse and its parent company are satisfied with decent profits rather than increasingly outrageous expectations every quarter. This story comes via Poynter. The New York Times ended the third quarter with more than 3 million paid digital subscribers to its main news product and crosswords and cooking verticals, the company announced today. With another million in print circulation, its total is more than 4 million. That result was achieved only with a heavy marketing push, Times executives explained in a conference call with financial analysts. Introductory digital subscriptions are now being offered for as little as $1 a week. The Tampa Bay Times confirmed this week that it had reduced the newsroom staff by 16 through a series of job eliminations of full- and part-time employees. The Times is owned by the Poynter Institute. 28 queries in 0.170 seconds.